“Omigod!! 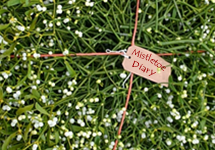 !” Mistletoe has just featured in Dr Who!! Sorry about the OmiGod, I know it’s getting a bit passe now*. But Dr Who and Mistletoe – what more could one ask for?? For a full plot synopsis try the Wikipedia site. I may have missed a bit – as I was watching the repeat on BBC3 – a digital channel we still don’t get here in densely populated Gloucestershire – a scandal the Beeb and/or the Government must sort out soon or I’ll be taking them to court for breach of contract on the TV licence. We can only watch it whilst holding the aerial lead and with a specially boosted signal – and even then it conks out every minute or two. But the cricked neck from holding the aerial was worth it.